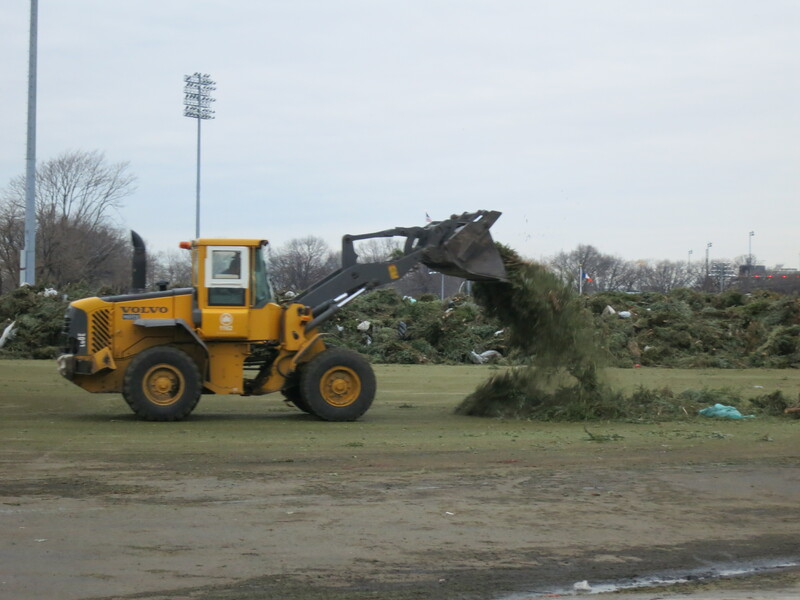 A front-end loader shakes a mouthful of uncleaned Christmas trees onto a field at Randall’s Island. PINE-SCENTED air fills your lungs from a hundred yards away. Where is this smell coming from three weeks after Christmas? Crossing the little bridge from Ward’s Island to Randall’s Island, it becomes immediately apparent: you have arrived at the Randall’s Island Christmas tree recycling site. On a cold night in mid-January, a front-end loader works tirelessly between two huge piles of trees on either side of a large field. The height of a one-story building and half a block long, these piles of trees dwarf the loader and the attendant pickup trucks. One pile contains Christmas trees straight from your sidewalk, carried to Randall’s Island by specially appointed Department of Sanitation trucks. These trees come from all over the city to this island in the East River and are laden with the usual Christmas debris: tinsel, plastic, ties, ornaments, and a dash of regular street garbage. The second mountain of trees is garbage free. To clean the dirty trees the front-end loader grabs a bucketful from the pile, drives into the middle of the field, raises its bucket in the air and rocks awkwardly back and forth until the entire load is strewn across the field. The loader repeats this step until the field is covered with a layer of debris and trees, trunks and all. Next a crew of pickers, still warm from waiting in the cabs of their trucks, descends on the field. All the foreign material is picked out by hand and thrown away. Finally, with a telephone pole clamped in its jaws, the front-end loader plows the cleaned trees into a giant mound at the edge of the field. 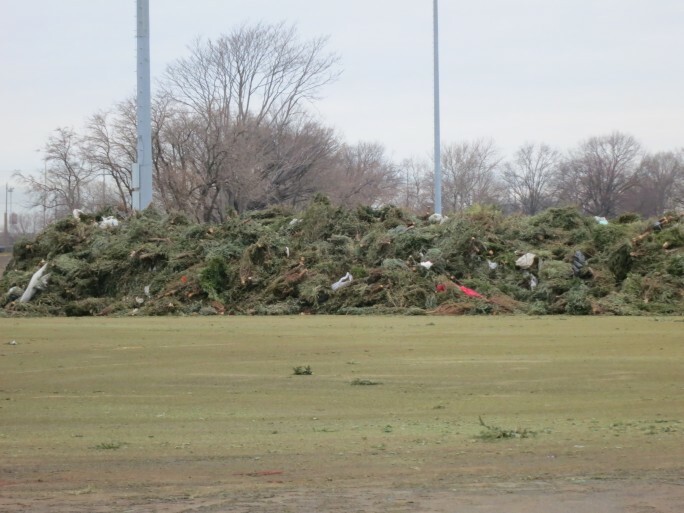 Randall’s Island is the central Christmas tree recycling site for the entire city of New York. 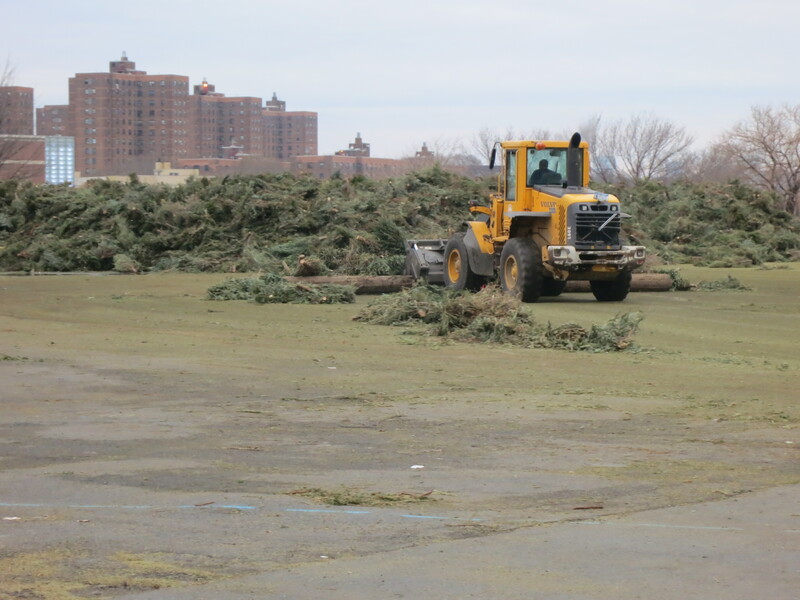 According to the city’s Office of Public Affairs, approximately 135,000 trees are at Randall’s Island at any given time during the post-Christmas mulching season. The cleaned trees are fed into a wood chipper. The mulch is then redistributed across the city to help trees, plants and flowers in the city’s parks. Mulch helps plants to retain moisture and insulates their roots. It also deters the growth of weeds, prevents soil compaction, and adds nutrients to the soil when it decomposes. Mulch is also given to community gardeners and volunteers to spread on street tree beds. Visitors to one of 35 Mulchfest sites (check the DSNY website or call 311 for details) can take home a biodegradable bag of mulch for his or her own tree or garden. Little pine trees are grown on farms far from New York. They are transported to the city, hawked on the street by vendors, and bought by innumerable New Yorkers as Christmas trees. When the holidays are over, or the needles start to fall off, or you just want your living room back, Christmas trees are set out on the curb, more or less as trash. After all the collecting, cleaning, and mulching, the story’s real conclusion is much more elegant: little bits of pine trees in parks and tree beds all over the city. Approximately 135,000 trees are at Randall’s Island during the season. These have yet to be cleaned. A front-end loader, with a telephone pole clenched in its jaws, plows cleaned trees into a mountainous pile. 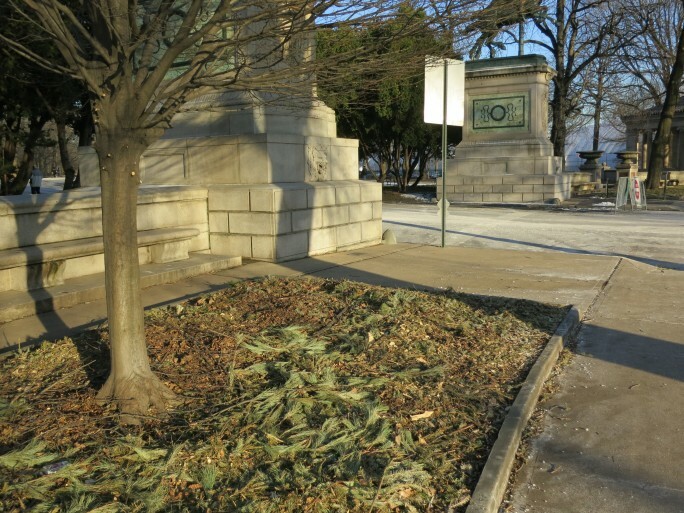 Mulched Christmas trees end up at city parks, like Brooklyn’s Prospect Park.